Looking ahead into the year of the Sheep. Last year in 2014 we discussed the year of the horse. If you remember, I mentioned that 2014 would be a year of chaos and change. One plane went missing, one was shot down over the Ukraine. ISIS terrorism became a prominent issue. The price of oil and other commodities declined, and there were numerous other political changes around the world. Before I go into my predictions, let's just clarify the difference between goat and sheep. The goat and sheep have very many similar characteristics, therefore both animals can designate the year. Where they co-exist they tend to generally live together. However this is more a cultural thing, as in countries like Malaysia or Thailand, sheep do not exist. What is important about the sheep and goat is that these animals flock and live together as groups and live a predominately social co-existence, which will be very important in the coming year. In life, we must live according to the season we are in, be it summer, fall, winter, or spring. The environment of 2015 is very poor economically, unstable politically in many places, and still suffering from the changes that began during the year of the horse. The year of the sheep indicates that people must work communally or organizationally, rather than individually to solve problems and deal with the challenges ahead. 2015 will not be the year of the individual, it will be the year of the organization. Another thing that the year of the sheep signifies, where sheep being followers, lower socio-economic communities will be the ones most affected by the changes taking place during the year. The world is not enjoying a period of economic growth at the moment, and it will be the sheep who will suffer from poor economic conditions alone. 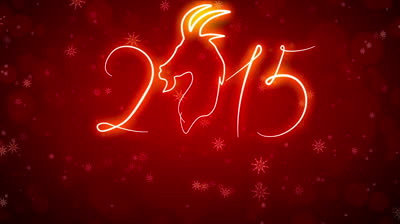 The year of the sheep is a year of enduring. People need to be patient, and maybe even put off entrepreneurial plans for the year ahead until brighter conditions prevail. This depressed environment will continue over the year of the Monkey and year of the Rooster. The suffering during these later years will then go to effect middle and higher income people. 2015 will also be a year where Government fiscal budgets are pulled in. This will lower interest rates further and dampen consumer demand. So what is best during the year of the sheep. It's probably best to go back to the fable of counting sheep to sleep, to get over all the frustration and tough conditions. This is a year of protecting yourself and holding, until these tough conditions pass after the next three years ahead. The year of the sheep will not be a pleasant year ahead. The gender of the sheep gives us some indication upon how to handle the coming year. The female sheep indicates it may be best to follow. But the male sheep may have trouble doing this as they tend to be stubborn, and stubbornness this year is a critical weakness. It will be very important to live under the shadow of society this year, rather than show off. Wool indicates wealth, knowledge and experience, so this year it's important to draw upon this wool to cope with what lies ahead. Consequently wisdom and maturity is the best way to solve problems occurring during the coming year. Go back over past sheep years to learn the lessons of this coming year. However most of all co-independence rather than independence is the key to success. What did Marx say? Religion is the sigh of the oppressed creature, the heart of a heartless world, and the soul of soulless conditions. It is the opium of the people. What did Novalis (Georg Philipp Friedrich Freiherr von Hardenberg) say? Their so-called religion acts merely as an opiate: irritating, numbing, calming their pain out of weakness.